You need to consider some information before start to creating a scenario. Select A Project, Project is the highest hierarchy level in Testinium. Therefore, all scenarios related to the project must be assigned to a related project. When the project is selected from the drop-down menu, SELECT SOURCE FILE section will be automatically updated. Scenario Name, Test Scenario Name. Group, you can group, manage scenarios and define the relationship among them such as parent/child. Max Execution Time, Max Time limit for a scenario to run. Select Source File, it is the root directory for a project. 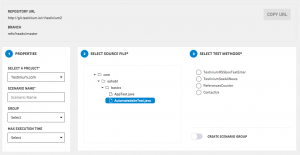 Select Test Methods, you can reach test methods from your source file and relate them with scenarios. Set System Parameters, you can set parameters to your scenarios. This makes the scenarios dynamic. Create Scenario Group, you can use this feature to make parent/child relation between scenarios.